In the figure the class hierarchy of the numeric classes; some methods of the classes are listed in the figure. Floats are double precision , always a digit is needed before and after the point: ".1" or "1." are not valid float numbers. "e" or "E" is before the (optional) exponent. Float numbers can be built with the Float method, converting its argument to a float number. Rational numbers are the ratio of two integers, used to express periodic numbers without a loss of precision. Complex numbers are printed as sum of a real and an imaginary part. Es. : (2+5i) . All numerical operators are implemented as methods of the Numeric class: for this reason a function-like notation is legal for operators: "1.+(2)" can be used, and returns the number 3, as: "1+2". The comparison operators: < ; > ; <= ; >=, == ; between? are implemented in the Comparable module; each numeric class implements in a different way only the operator: <=> (sometimes named: spaceship operator); the Comparable operators use the <=> operator of the specific class to give results. 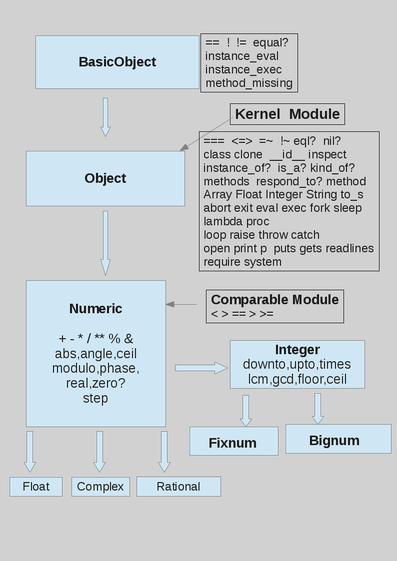 This mechanism is similar to the use virtual functions of the C++ language. In the following table the most used methods of Numerics are included, also those which apply only to some subclasses of Numerics.